As Washington lawmakers pursue significant policy reforms, the non-partisan Congressional Budget Office (CBO) warns that the national debt remains on an unsustainable path. Under current law, federal debt is now projected to reach 150 percent of gross domestic product (GDP) within 30 years — by far an all-time high. Unless policymakers act, CBO concludes that rising debt could jeopardize long-term economic growth, crowd out critical investments, reduce policymakers’ flexibility to respond to unforeseen events, and raise the risk of a fiscal crisis. Based on this unsustainable outlook, the dangerous path of federal debt remains a critical issue for the budget and the economy. Changes to spending and tax policies are necessary to put our long-term debt on a sustainable path. Federal debt is already at its highest level since 1950 and is projected to climb to 150 percent of GDP under current law by 2047. Rising debt is a result of a structural imbalance between revenues and spending: under current law, spending growth, which is fueled primarily by the aging of the population and growing healthcare costs, significantly outpaces the projected growth in revenues. As the debt grows and interest rates rise, interest costs are projected to increase rapidly. By 2028, interest will become the third largest category of the budget, behind only Social Security and Medicare. Rising debt will harm our economy and slow the growth of productivity and wages. On our current path, the annual average income loss for a 4-person family would be $16,000 by 2047. CBO estimates that federal debt, which is already at high levels, will climb significantly over the next 30 years. In CBO’s latest projections, debt is expected to climb from 77 percent of GDP in 2017 to 150 percent of GDP in 2047, based on current law. Debt at those levels would be unprecedented. Over the past 50 years, debt has averaged only 40 percent of GDP and, as recently as 2007, it was as low as 35 percent of GDP. Since 1790, our debt has never exceeded 100 percent of GDP, except for a brief time during World War II when it peaked at 106 percent, after which the debt fell rapidly as a share of GDP. "…would reduce national saving and income in the long term; increase the government’s interest costs, putting more pressure on the rest of the budget; limit lawmakers’ ability to respond to unforeseen events; and increase the likelihood of a fiscal crisis, an occurrence in which investors become unwilling to finance a government’s borrowing unless they are compensated with very high interest rates." On our current path, rising debt would reduce real (inflation-adjusted) income for a 4-person family by $16,000 on average, in 2047. This represents a 4.4 percent loss in income, compared to stabilizing the debt. WHY IS THE NATIONAL DEBT ON A PATH TO GROW SO MUCH? 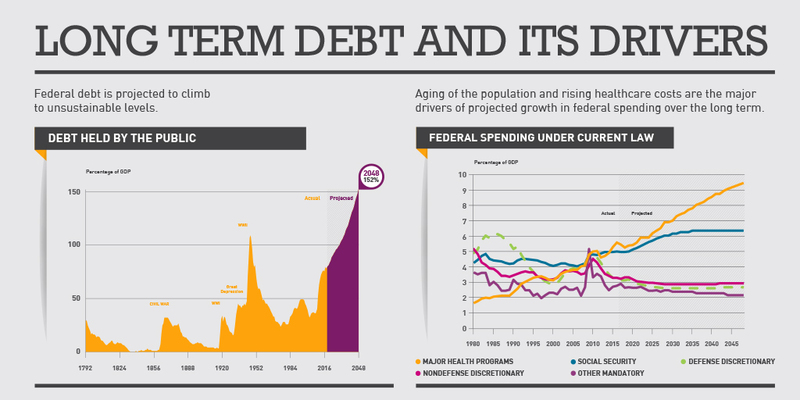 The growth of our debt stems from a fundamental imbalance between spending and revenues. Under current law assumptions, CBO anticipates that federal spending will grow from 20.7 percent of GDP in 2017 to 29.4 percent of GDP in 2047. 55 percent of this increase is growth in interest costs. Revenues are also projected to increase during this period, growing from 17.8 percent of GDP in 2017 to 19.6 percent in 2047, but not nearly enough to match the projected growth of federal spending. Social Security and the federal government’s major healthcare programs account for 100 percent of the projected growth in non-interest spending (as a percentage of GDP) over the next 30 years, under current law. Healthcare by itself accounts for approximately 70 percent of this growth. Spending on these two budget categories is projected to grow by 50 percent, from 10.4 percent of GDP in 2017 to 15.6 percent of GDP in 2047. By contrast, spending on all other categories of the budget, which include critical areas such as national defense, transportation, law enforcement, and public health research, is projected to decline as a percentage of GDP from current levels. WHAT DRIVES THE GROWTH OF GOVERNMENT SPENDING? The growth of spending on Social Security and major healthcare programs is driven by two key factors: the aging of the population and the growth of healthcare costs per capita. Aging of the population is the most significant factor driving spending over the next 30 years. The aging is the result of baby boomers entering retirement years, combined with increases in longevity. The number of people aged 65 and older is projected to increase by 68 percent from 50 million in 2017 to 84 million in 2047. Within 30 years, one fifth of the adult population will be 65 or older. These trends will put significant pressure on the federal budget by driving up spending on entitlement programs that primarily serve older populations, such as Social Security, Medicare, and Medicaid. Growing healthcare costs per enrollee also plays an important role in driving spending over the next 30 years. Although healthcare costs have grown less rapidly in recent years, in part because of the overall economic slowdown that began with the Great Recession, CBO projects that per-enrollee healthcare spending will continue to grow at a faster pace than GDP per capita. This growth will put upward cost pressure on the federal government’s two major healthcare programs: Medicare and Medicaid. As federal debt increases, interest costs will impose a growing burden on the federal budget and could crowd out the funding of important priorities. CBO projects that interest payments on the debt will climb by over 200 percent from 6.8 percent of federal spending in 2017 to 21 percent in 2047. By 2026 CBO projects that interest costs alone could exceed what the federal government has historically spent on R&D, nondefense infrastructure, and education — combined. By 2047, interest costs are projected to be more than double the historical spending on those investments, as a share of GDP. With federal debt on an unsustainable path, now is the time to make sensible decisions that will improve America’s long-term fiscal outlook. By taking action now, Congress and the President can lay a better foundation for future generations that allows greater investment, promotes stronger economic growth, and assures a more secure safety net. Taking action now would provide time for reforms to be implemented gradually, giving Americans time to adjust to the policy changes. The longer we wait, the more difficult it will be. Under current law, CBO estimates that for federal debt in 2047 to be no higher than its current share of GDP (77%), we would need to cut noninterest spending or raise revenues by 1.9 percent of GDP per year starting in 2018. However, if we waited 5 years to act, the size of these required reforms would grow by 21 percent. In the short term, putting the debt on a sustainable path will reassure financial markets, boost economic confidence, reduce uncertainty, and reduce fiscal burdens on future taxpayers. Policymakers can help today’s economy by agreeing on a comprehensive plan to stabilize the debt. Over the long term, a stable fiscal policy would raise wages, bolster family incomes, and enable a more prosperous future. No American wants a future in which our economy is saddled with debt, starved of investment, and struggling to grow. Only with a fiscal outlook that is stable and sustainable can we ensure that we have sufficient resources to invest in our future. As lawmakers consider changes in a number of areas with significant fiscal implications, they should use the opportunity to chart a stable, sustainable path for growth.